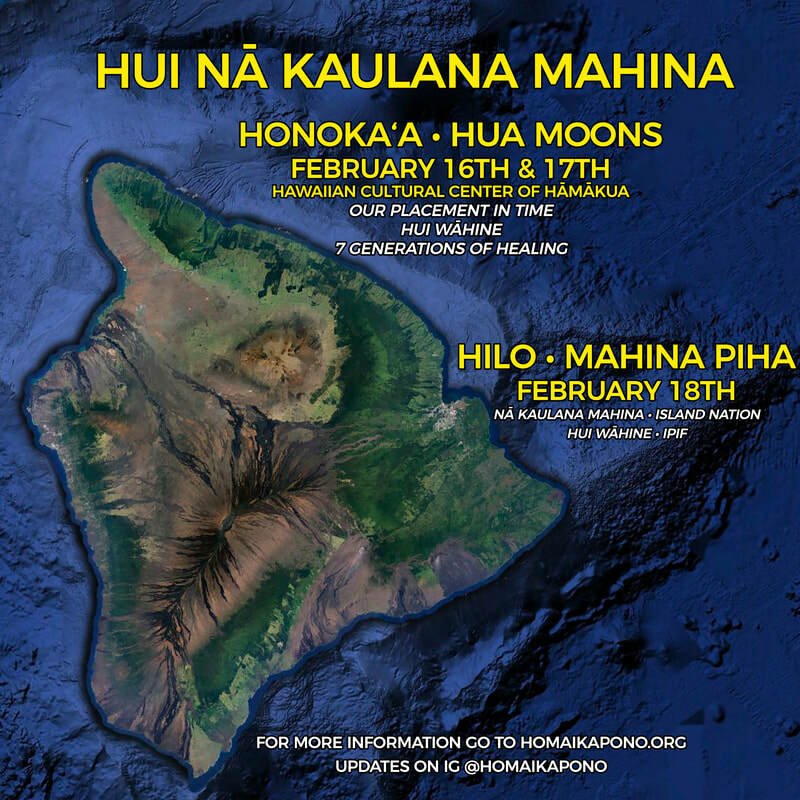 Each hui has the theme of healing through a dedicated practice of kilo mahina (moon) • ka Lā (sun) • nā hōkū. Kilo is literally translated into english as "to observe." The tūpuna of old lived in a na‘au based system that resonated with the intuition. They did not think in modern terms of observation. They lived with and were synchronized to mahina, ka Lā and nā hōkū through the na‘au. To kilo mahina is to kilo a part of the self that is connected to Hina. To kilo ka Lā is to kilo a part of ourselves linked to ao (light) and pō (dark). To kilo nā hōkū is to kilo a part of ourselves that is reaching into eternity. This practice may in fact be one of the greatest tools for healing generational trauma. A common theme will be the emphasis will be on the traditional learning process, our relationship with tūpuna (indigenous elders) and the locations that become our places of learning. This is support for the journey that is ultimately connected to the people and places in our lives. There is not one size fits all to this process. It is always unique. The traditional perception of time is not accurately expressed in a clock or a calendar. Time moves in a way that is beyond human constraint. 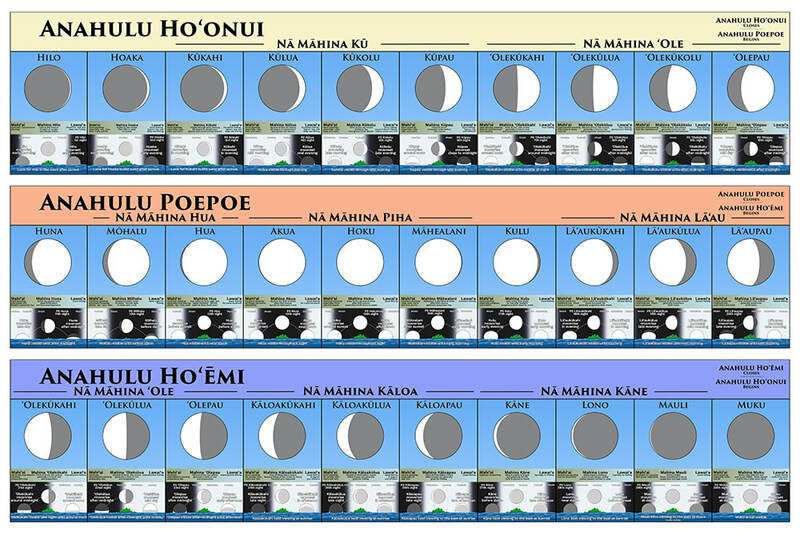 Our primary time markers are found in the movements of mahina (moon), ka Lā (sun) and Nā Hōkū (celestial bodies). These three "spheres" are woven into our planets environmental cycles. These three cycles are uniquely related to each "place" on our planet. The timing systems developed by the indigenous peoples were deeply harmonized to the timing of each specific place. One of the most important components of the healing process is to work with the timing of the ‘āina, wai, and kai (land, water, and ocean) we are most connected to. This is a relationship that is deeply attuned to psychological and spiritual wellness. We often find our "selves" in the places we have the greatest intimacy with. "Seven Generations" is a unit of time often meant to explain how our choices will affect the generations to come. Our current paradigm is also the product of a world set in motion generations ago. Humanity is currently in a stage of excessive materialism. With materialism comes a loss of self. The feeling of disconnection is often the source of psychological and spiritual discomfort. The cause of human created dysfunction, whether social or environmental, is rooted in the collective self. In our individual lives we can choose a path that will allow us to regain a sense of connection with the environment and life itself. This connection occurs within us first. Our internal moving parts synchronize and the relationship to life expands. This process takes generations to normalize. To evolve in a new direction takes resolve, commitment, clarity and surrender. Oftentimes this feels like an investment. Numerous epiphanies and hō‘ailona are part of this process. Mana Wahine in itʻs most basic form is that of a sacred container allowing for life to grow. The ultimate physical structure of this foundation is the womb itself. While the illumination of ma-hina (the moon) is one of the primary wahine forms we are oriented to there is much more to this energy. Papa (or Haumea) as the earth is in many ways a womb. Certain constellations are divinely celestial representations of the role of wahine in the structure of time and space. The nature of this hui is detoxifying and aligning with mana wahine which exists in both living matter and its spiritual essence. We are currently in a paradigm where mana wahine (female energy) is the antidote for generations of mana kāne (male energy) that became oppressive. The environment is a reflection of the self. When our inner world and the outer world are aligned we often feel a profound connection to the movement of life. The cycles of Nā Kaulana Mahina (lunar), Ka Puni o ka Lā (solar), and Nā Hōkū (celestial) are mirrors to our inner world. Alignment with the timing of these three spheres allows an inner alignment to occur.